It has been too long between posts and I am sorry. I have been so busy preparing for upcoming events. The Spring Quilt Retreat is fast approaching as well as the studio tour the 1st of May. I have taken time to just enjoy some quiet time to myself and this is it. I had to put it aside for awhile as I got an infection in my thumb!!! Spent 8 hours in emerge for that.. Read a whole book...Oh Dear! Don't know how I got the infection but it is OK now. I'm off to the city to run a few errands so will catch you later. It's nice to learn something new. I haven't knit in years and have now taken it up again. Great to do while watching TV in the evenings. 8 hours in emerg! That's nuts. I hope it was a good book. 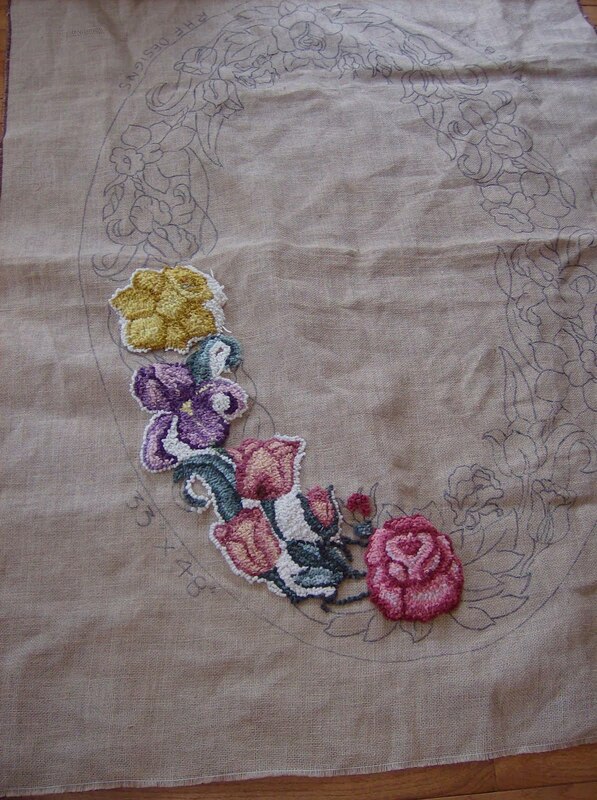 The rug hooking looks great but very ambitious - way to go! Maggie I was learning rug hooking way back when I was pregnant and the Dr. advised me to stop until the baby was born. My tummy kept getting in the way. Never finished that rug. You are an amazing women! The rug hooks looks fab!!! Yes it was a great book Colleen. It was about Queen Victoria's children.. Very intriguing.. I have lots more to tell you but I should go.More later... and big news...with pics. BTW I awakened to hear a familiar bird singing.. when I looked out the window there was a robin singing in the birdbath..... YEAH!!! !Let's break open the spring clothes! I love rug hooking, just starting to learn myself:) Stop over to my blog for a give-a-way...thanks for being such a good blogging friend! Gorgeous rug -- your shading is fantastic -- also love your new frame -- remember the lovely little blue doll you sent me? I took to to the prayer shawl crochet class I was giving -- it is so lovely and I love it so much -- it has had a place of honor ever since I received it ages ago -- anyway, at class we were talking about "healing" colors and the doll was a perfect example. Friendships are so special -- and I treasure ours.